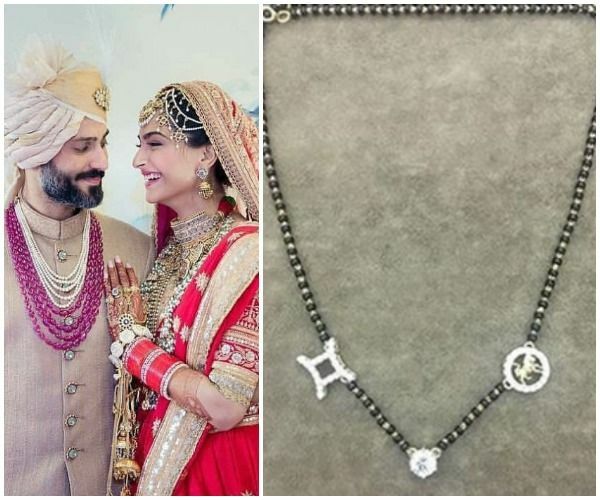 One of the most interesting details of the most happening wedding of Bollywood fashion icon Sonam Kapoor and Anand Ahuja was none other than the gorgeous mangalsutra designed by the bride herself. It was simple yet beautiful. 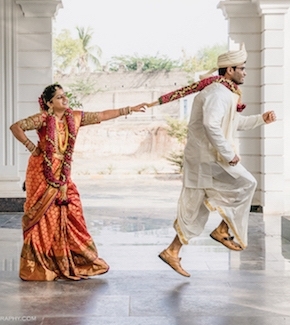 Something that every bride dreams of what her mangalsutra would be like. 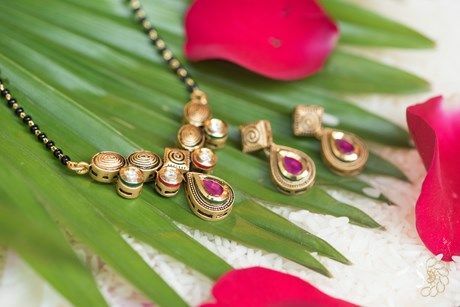 But we all know that in this huge jewellery market with innumerable beautiful mangalsutra designs it becomes very difficult to select yours. Well, worry not! 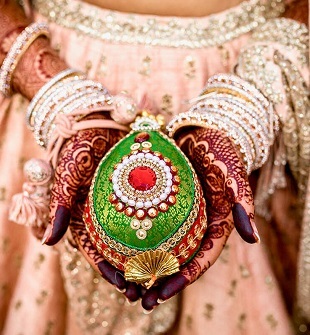 This is where we help you out with some beautiful mangalsutra designs that are rocking the wedding market. 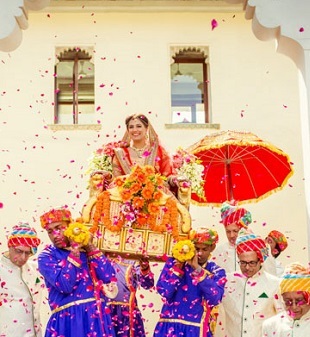 However, before moving forward to the designs, here is something that one must know about the gorgeous bridal accessory that binds the bride and groom. Mangalsutra is also referred to as a sacred thread symbolizing the relationship between a bride and the groom. 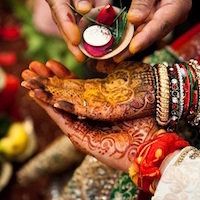 Worn as a symbol of marital chastity and purity, it is a symbol of promise from a husband to his wife of togetherness. Nowadays, it has also become a part of a fashion statement and hence, we have innumerable designs doing rounds in the market. Further, you may not know of this, the black beads that go around the neck is supposed to protect the couple from any negative energies. You may not believe in it, but this fact is believed by many elderly women of the Indian culture. So without delay here are top 10 beautiful mangalsutra designs that are rocking the wedding market. Different right? The design for the center multiple chains sections is not new. One may have seen multiple chain neckpieces many times but incorporated into one of the beautiful mangalsutra designs is something new. It elegant yet amazing. 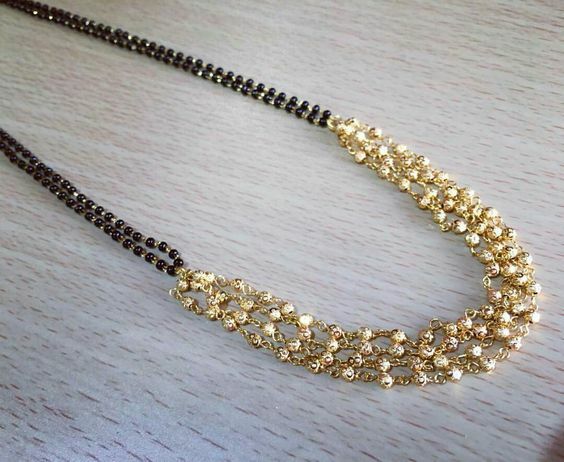 Stone studded mangalsutra is not new in the market. It is but an age-old design, however not very popular. This design today is loved by many new brides or going-to-be brides who are opting for this pattern. The color of the stones as you may have guessed by now can be changed according to your choice. Note: you can even change the number of beads in the design. Remember, one big bead surrounded by various beads of your choice and your design is ready. Talking of jewelry and not including Kundan is a huge offense to this wonderfully crafted stones that can glam up your complete look. 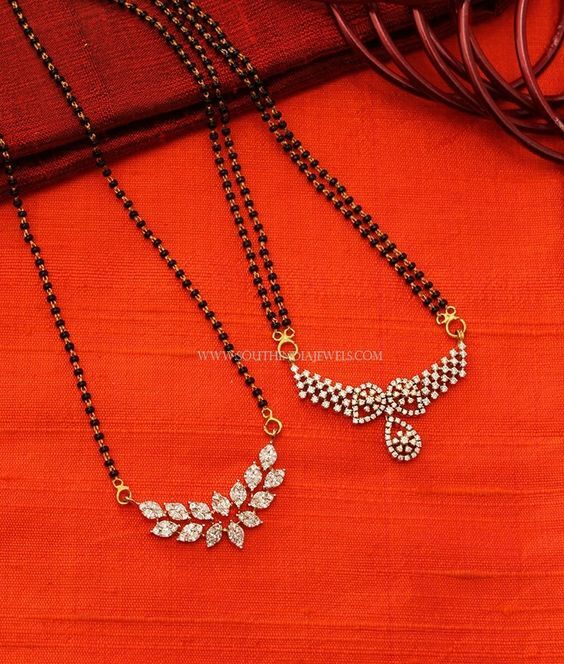 Incorporated in these beautiful mangalsutra designs would just increase your love for it. It is gorgeous, elegant and simply amazing. No doubt, it is loved by the brides. 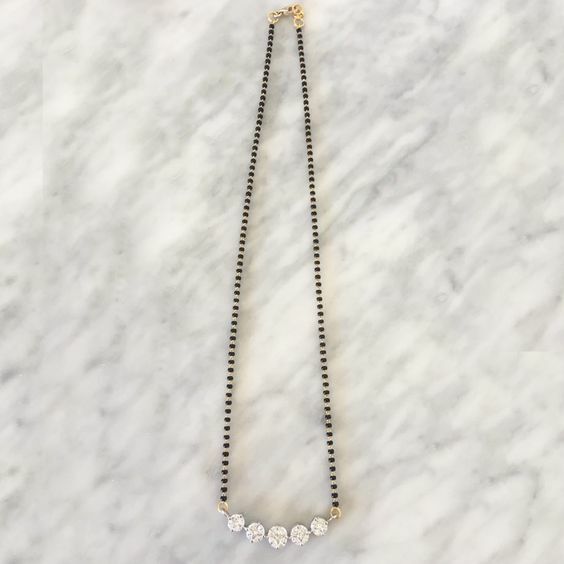 Diamonds are indeed a woman’s best friend. It will be there in every phase of life. Look at this design itself. It is so simple but screams attention. 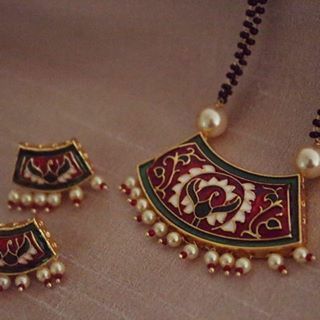 It is pure royalty when it comes to beautiful mangalsutra designs. It was, is and will forever be one of the options popular among the ladies. 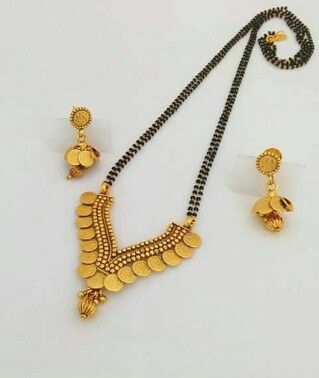 One of the many new popular and beautiful mangalsutra designs, flower shaped designs of gold have gained a lot of popularity among the ladies. It is chic and modern. Therefore, combined with style and elegance it is not unbelievable that it is being loved by the modern woman. 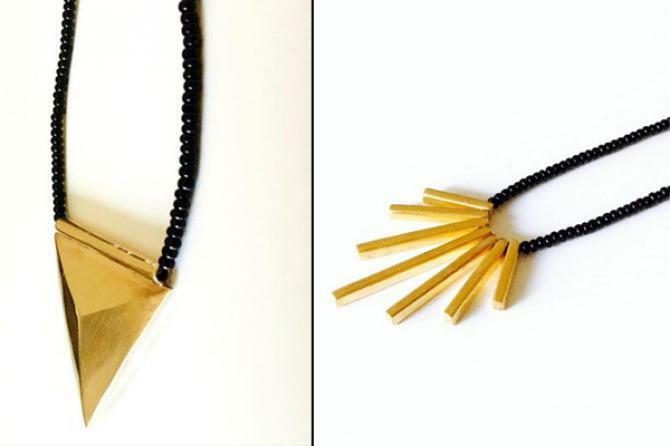 Gorgeous and royal is how I would personally define this piece. No one can disagree with the fact that temple jewellery has gained its due reputation along with popularity. There is no reason to not blend it with the concept of mangalsutra to give us one of the most breathtaking mangalsutra designs. 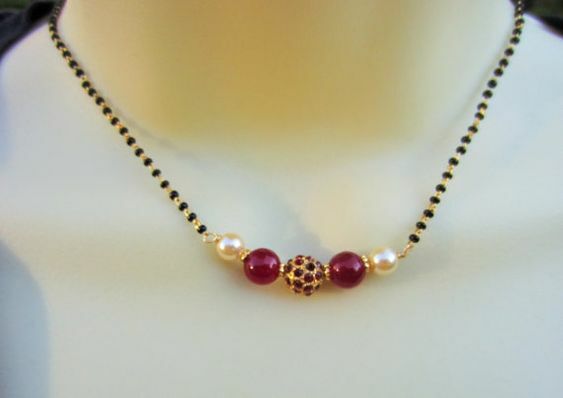 Not very common but very gorgeous is something that this design of mangalsutra screams. However, due to this non-commonality, it has been rocking the market. Modern art is liked by all and loved by many. So why not wear it. It is light and simple. These geometrical patterns can be worn with any type of clothes, be it western or traditional. 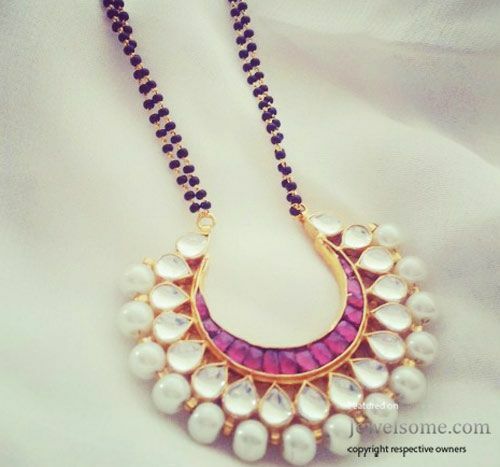 When it comes to jewellery collection, coin jewellery is one piece that has become very popular among the ladies. And in recent times this design of mangalsutra has become popular. If you are looking for something chic and stylish then this piece that has been doing rounds in the wedding market is it for you. It is most definitely a mangalsutra but unlike other designs, this one is not wore around the neck but round the wrist. So, aren’t they wonderful? There is something for everyone, from contemporary to traditional, each one of these designs can be customized according to your budget.